Porsche defines themselves as creators of engineering excellence. And I must admit having driven almost every modern Porsche, there is no arguing with that fact. Porsche are definitely first-rate engineers and their cars are benchmarks of Teutonic engineering. Nowhere does any of Porsche's communication, however, convey that they know how to design cars. In the last decade we have seen some startlingly ugly designs coming out of Stuttgart. Except for the Cayman, which I believe is now the best looking Porsche there is, you simply have to ignore the way the rest of the range looks. The Cayenne was a big ugly piece of metal when it started off and the minor cosmetic changes haven't really made a big difference to the way it looks. The Boxster too did not know whether it was coming or going, and small detail changes have made it a more interesting car yet the inherent language is still gibberish. And then there was the Panamera, probably the ugliest of them all; sorry, but there is just no way to dull the description or be diplomatic about it. The Panamera, despite its focus on be an ultra-luxurious 4-door 4-seater sedan, just does not look the part. 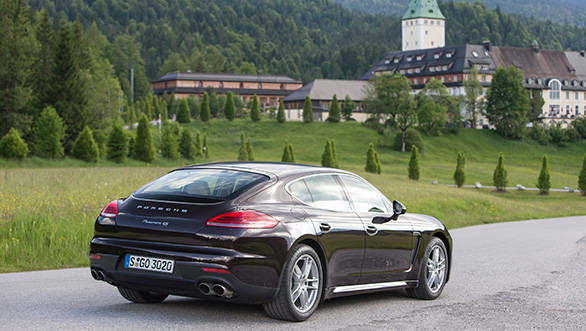 What was the Porsche design team thinking about when they drew up the Panamera? Seeing this second generation Panamera look much the same makes the wait for the forthcoming Panamera Sport Turismo concept - first showcased at the Paris motor show last year - unbearable. That concept is visually the proper embodiment of what a Porsche in any form should look like. Nevertheless, I've come all the way to Munich to drive the second generation Panamera just a week after driving the 2013 Cayman in India. So my expectations, as you can understand after having driven the sensational Cayman S, were high and not just of the styling. Without pointers, it would be next to impossible to spot the differences between the new and old Panamera. But ignore the visual changes; the Panamera is something else once you get inside the cabin and thumb the starter. Oh wait, you can't get that as standard equipment yet in a Porsche. So you turn the key and what you hear is a nice engine note with a sharp bark, albeit not as raucous as it used to be, and this is important. You see, the second generation Panamera largely replaces the V8 with a V6 derived from the V8. So almost all the models now utilize the smaller, more efficient V6 engine except for the GTS, Turbo and Turbo Executive variants. The car I drove is the Panamera 4S, which is one of the variants to come to India, though the more popular choice will be the diesel. The Panamera 4S will now be available only with the 3.0-litre V6 engine and mated to twin turbos and a 7-speed dual-clutch transmission it delivers 420 horsepower to all four wheels. 420 horses is still a very generous power rating, because let's face it: the only time you would use even a fraction of that power, is never. So 420 horses becomes a moot point unless like me, you come to Munich and drive the Panamera 4S on unrestricted stretches of the autobahn. Then you can slip the car into Sport Plus mode, tap the button that amplifies the exhaust note and kill the throttle pedal with your right foot. And then feel how a near-2 ton hulking piece of metal comes to life. It's extremely unnerving to experience the sort of acceleration big sedans like the Panamera are capable of. 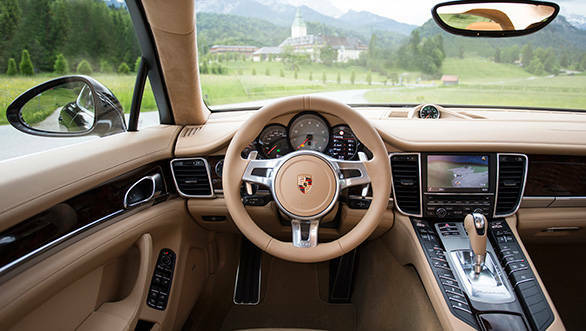 If there was a list of top hundred experiences, driving cars like the Panamera would be in the top ten. 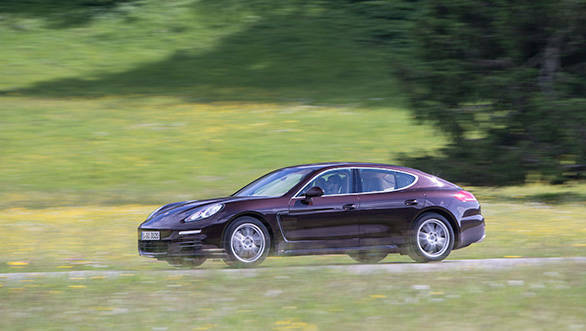 It takes the Panamera just 4.8 seconds to demolish the 100kmph mark. It's all thanks to twin turbos, a new higher pressure fuel injection system, direct injection, a shorter stroke and variable valve timing which is now also available on the exhaust side. 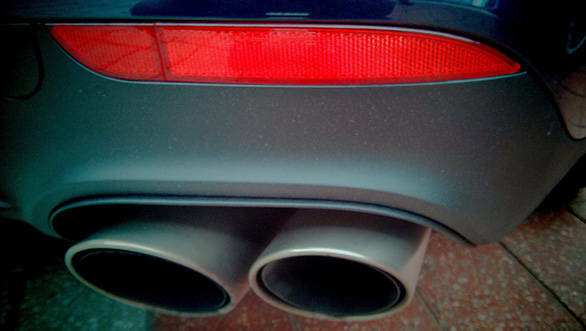 The biturbo system in the Panamera 4S is 20 horsepower and at a max 520Nm, 20Nm more powerful than the older V8 engine. It can be used in one of at least three ways. The best being sport mode, which stiffens the suspension mildly, changes the shift points using the meatier portion of the power curve to dominate and creates a more vibrant exhaust note by increasing the opening of the exhaust flap. The Sport Plus mode is also terrific to realise the full potential of the V6 biturbo but it increases suspension stiffness to a uncomfortable pitch and in Indian conditions this would be detrimental to your personal well being. But if you do ever decide to take your Panamera to a track day, this car would surprise you with its benevolence. It simply continues to give and give; more power, more grip and more precision across every corner past every straight. The Panamera then, is every bit a Porsche. Under all that glossy veneer is DNA injected by one of the best sports car manufacturers in the world. The 4S simply enhances that entire dynamic experience with its four-wheel drivetrain. Part of the fantastic handling and cornering precision owes a debt of gratitude to the new V6 engine. 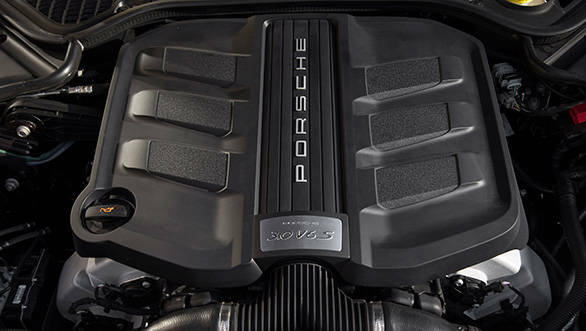 Having taken two cylinders off the V8 has reduced the length of the engine and this forces the centre of gravity closer towards the centre of the car compared to the previous generation Panamera. It has made the Panamera sharper and definitely the most dynamic luxury four-door sedan available in the market today. 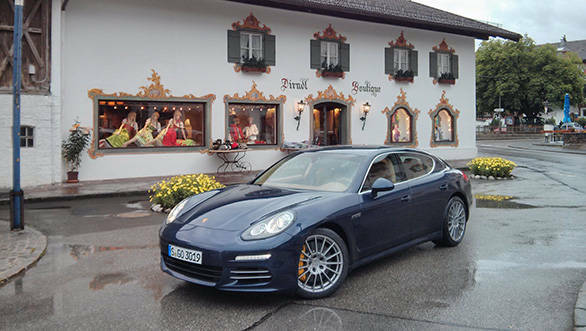 There is nothing any of the other Germans could offer that comes close to the dynamic prowess of the Panamera. The Panamera has the solidity expected of this class of car but also surprises with the agility of a sports car. The level of equipment and luxury is unparalleled. whats coming to India is the 4S and probably the Turbo and later on even perhaps the GTS. Ignore the way it looks and you still have a tremendously appealing package.